Opponent OH Hit – Go Gap / Our Right Side Block OH MH RS OH OH2 S MH2 L1 RS = Moves out to Opponent OH places LEFT HAND on the ball and wrap RIGHT Hand around the ball. 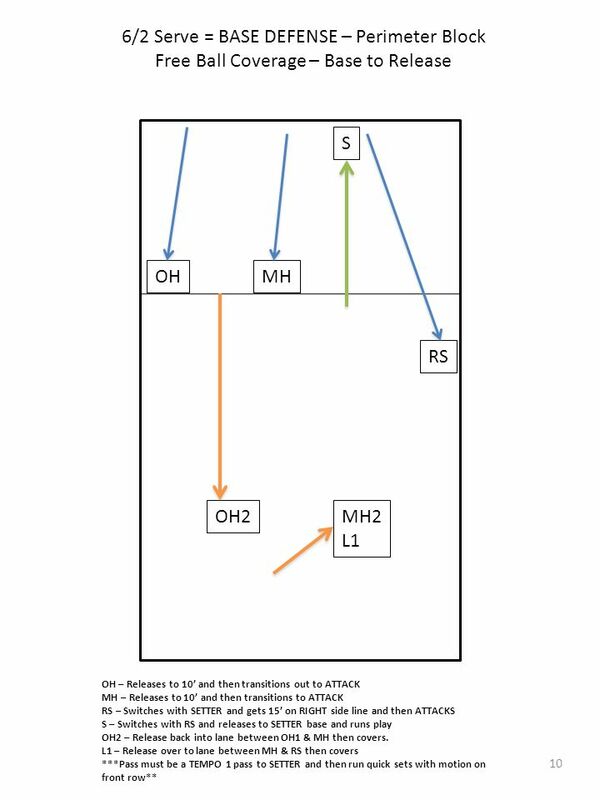 MH = Moves out to our OH and blocks with RS OH1 = Moves to 5’ and covers tips & balls off block OH2 = Off the MH inside shoulder and sees the hitter off that shoulder L1 = Sees Hitter in Split and moves off the what they see hitter shoulders & block. S= Moves to RIGHT sideline with RIGHT foot on side line & Hands Up. 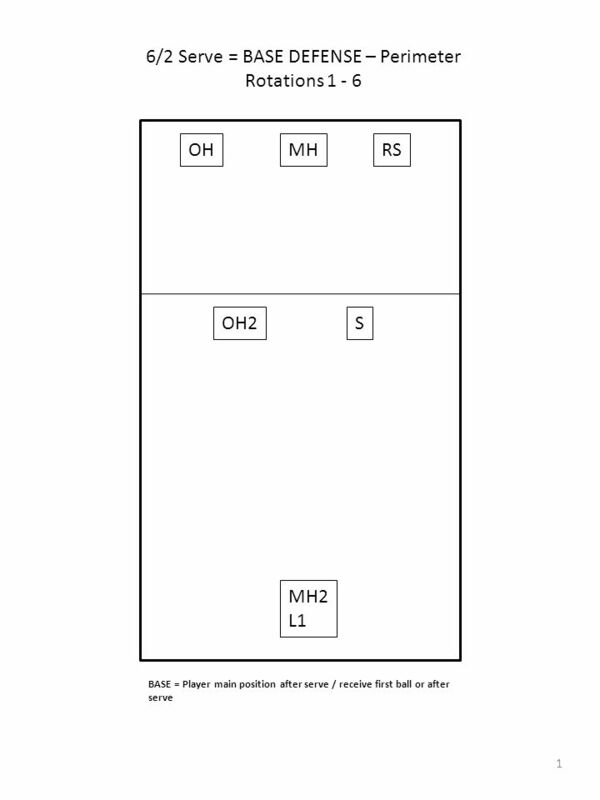 Opponent OH Hit – 3 Gap / Our Right Side Block OH MH RS OH OH2 S MH2 L1 RS = Sits in 3 Gap – Yells 3 - places LEFT HAND on the ball and wrap RIGHT Hand around the ball on block. 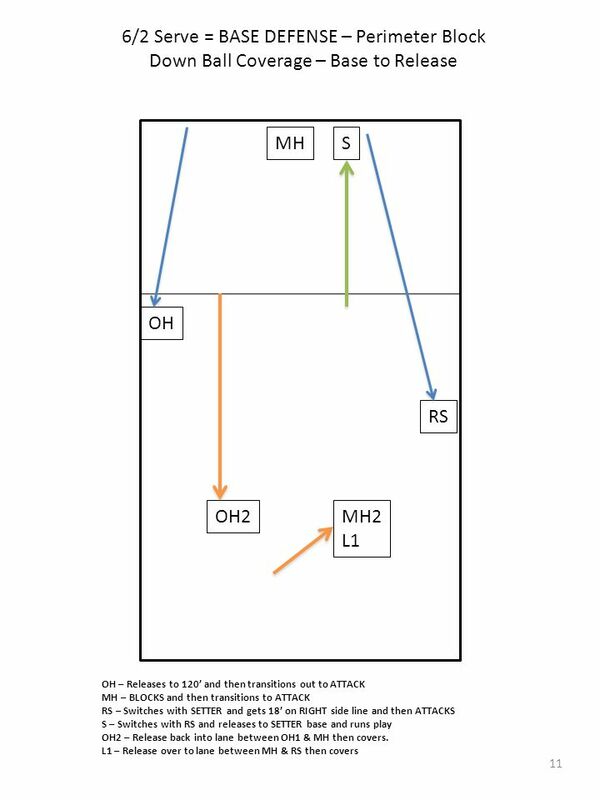 MH = Moves out to our OH and blocks with RS OH1 = Moves to 5’ and covers tips & balls off block but out closer to side line OH2 = Off the MH inside shoulder and sees the hitter off that shoulder L1 = Sees Hitter in Split and moves off the what they see hitter shoulders & block. S= Moves to RIGHT sideline with RIGHT foot on side line & Hands Up. Opponent MH Hit – B Gap Attack MH MH RS OH S OH2 MH2 L1 RS = Sits in 3 Gap – Yells B - places LEFT HAND on the ball and wrap RIGHT Hand around the ball on block. 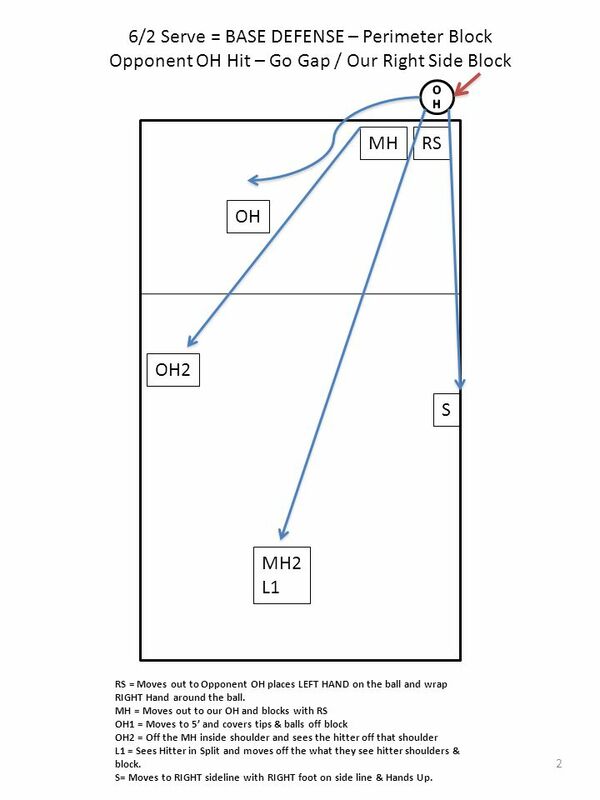 MH = Moves out to our RS and blocks with RS OH1 = Moves to 5’ and covers tips & balls off block but out closer to side line OH2 = Off the MH inside shoulder and sees the hitter off that shoulder L1 = Sees Hitter in Split and moves off the what they see hitter shoulders & block. S= Moves to RIGHT sideline with RIGHT foot on side line & Hands Up. Opponent MH Hit – Slide Attack MH OH MH RS S OH2 MH2 L1 OH = Sits in Go Gap– Yells SLIDE - places RIGHT HAND on the ball and wrap LEFT Hand around the ball on block. DO NOT FLOAT OUT TO ANTENNA! 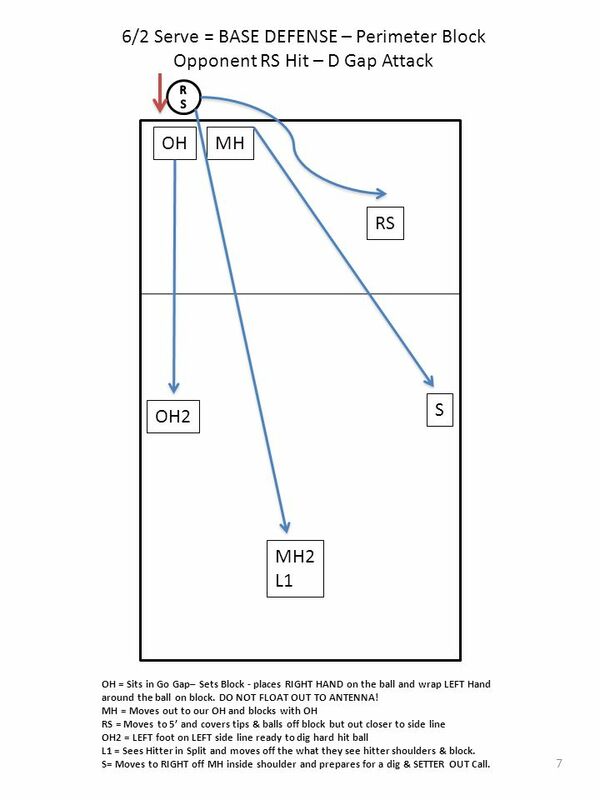 MH = Moves out to our OH and blocks with OH RS = Moves to 5’ and covers tips & balls off block but out closer to side line OH2 = LEFT foot on LEFT side line ready to dig hard hit ball L1 = Sees Hitter in Split and moves off the what they see hitter shoulders & block. S= Moves to RIGHT off MH inside shoulder and prepares for a dig & SETTER OUT Call. 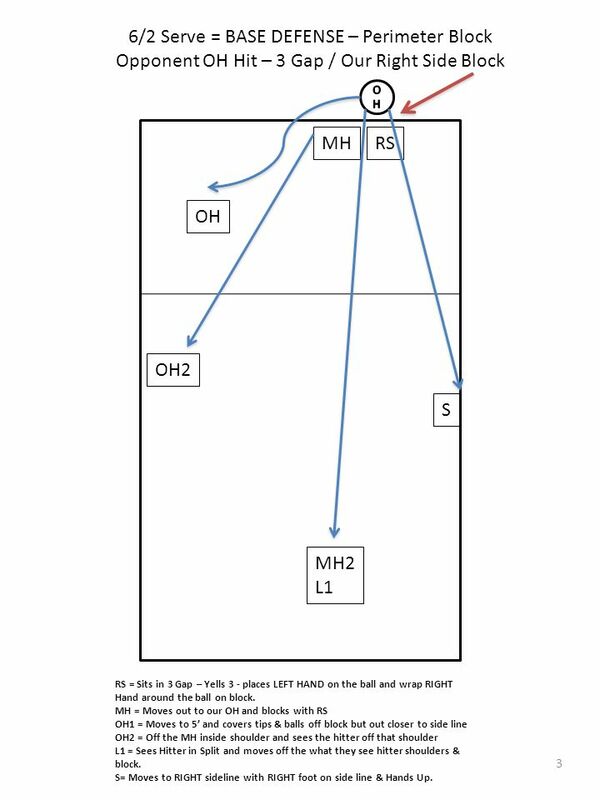 Opponent RS Hit – D Gap Attack RS OH MH RS S OH2 MH2 L1 OH = Sits in Go Gap– Sets Block - places RIGHT HAND on the ball and wrap LEFT Hand around the ball on block. DO NOT FLOAT OUT TO ANTENNA! 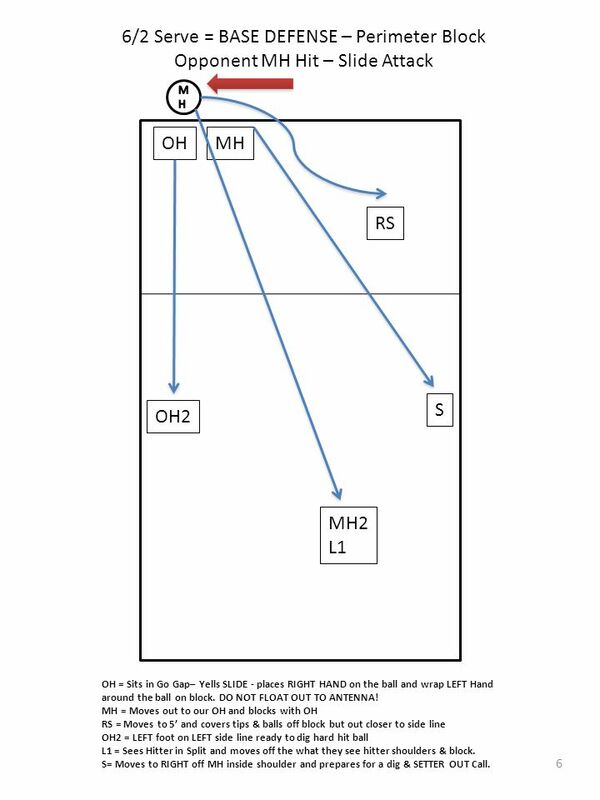 MH = Moves out to our OH and blocks with OH RS = Moves to 5’ and covers tips & balls off block but out closer to side line OH2 = LEFT foot on LEFT side line ready to dig hard hit ball L1 = Sees Hitter in Split and moves off the what they see hitter shoulders & block. S= Moves to RIGHT off MH inside shoulder and prepares for a dig & SETTER OUT Call. Opponent RS Hit – C Gap Attack RS OH MH RS OH2 S MH2 L1 OH = Steps Into C Gap– Yells C- places RIGHT HAND on the ball and wrap LEFT Hand around the ball on block. 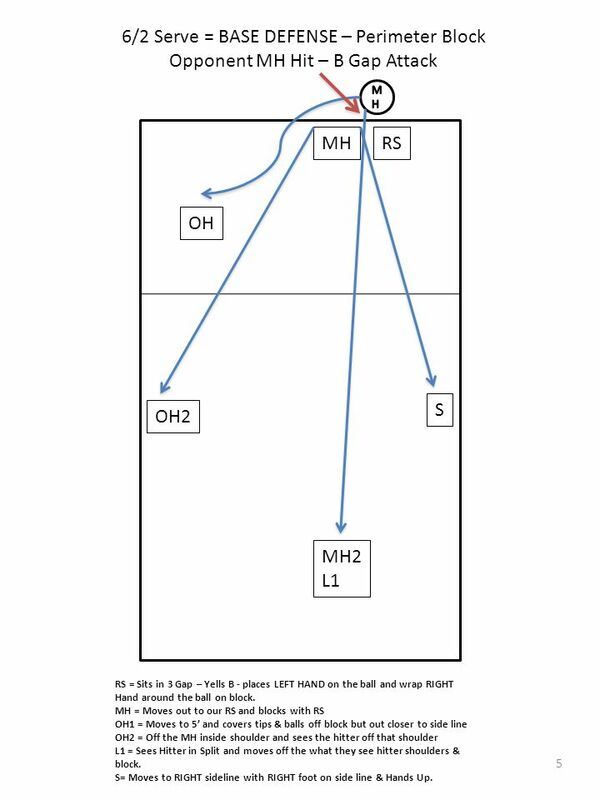 MH = Moves out to our OH and blocks with OH RS = Moves to 5’ and covers tips & balls off block but out closer to side line OH2 = LEFT foot on LEFT side line ready to dig hard hit ball L1 = Sees Hitter in Split and moves off the what they see hitter shoulders & block. S= Moves to RIGHT off MH inside shoulder and prepares for a dig & SETTER OUT Call. 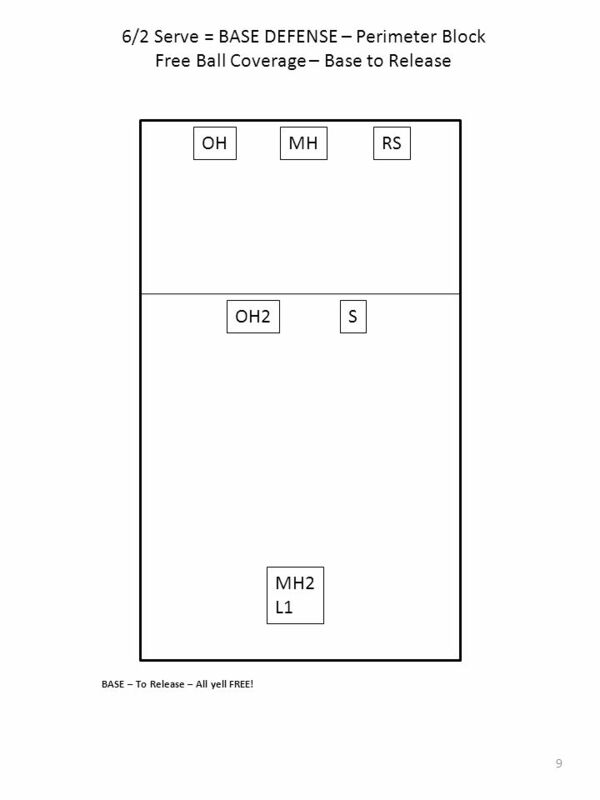 Free Ball Coverage – Base to Release OH MH RS OH2 S MH2 L1 BASE – To Release – All yell FREE! Download ppt "6/2 Serve = BASE DEFENSE – Perimeter"
VOLLEYBALL Origin: William C. Morgan of Springfield College in Massachusetts devised the rules of volleyball in Etiquette: The winner of a coin toss. Lincoln-Way West Volleyball Serve Receive & Defensive System. 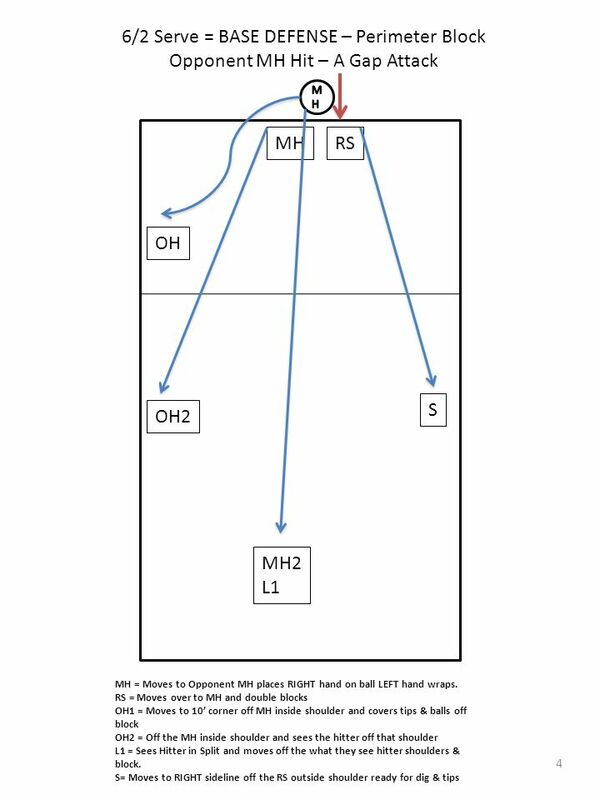 M3 M2 A3 P1 S Breakdown: Middie Across Top Drill Details: 3 cones set for M2, M3 and A3. Balls start w/ M2 who runs across top to location of M3. ZŠ Klášterec Czech Republic. The sport originated in the United States, and is now just achieving the type of popularity in the U.S. that it has received. ANOTHER WAY TO IDENTIFY ALIGNMENTS EOA VOLLEYBALL OFFICIALS CLINIC 5 AUGUST 2012 CHRIS LONG. TOSS The Toss sweep has become one of the most productive plays in our offense. The toss play is with deep motion to the Halfback Quick toss to the HB/Fullback. 14 Mizuno Wahines Peninsula Juniors Volleyball Club. Why & How we Prioritize our Training & Systems TRENT UNIVERSITY POSSESSION VOLLEYBALL.